If you’ve been considering the move to a 13-inch wide printer, the options have never been better. 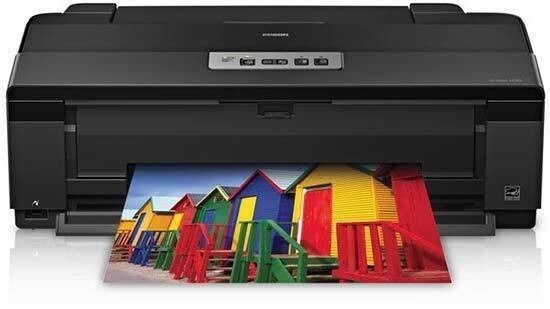 With three printers available from Canon, and four models, including the Artisan 1430 reviewed here, from Epson, there is a wide range of choice in both features and price. There are two basic types of inkjet printers available - dye based, and pigment based. While pigments have historically had the reputation of longer print life, dye inks have had the advantage of producing more vibrant colors. These differences are not as obvious as they once were though, with dyes making great strides in longevity, as well as the types of media they can print on. In the case of the Artisan 1430, Epson is claiming up to 200 years in storage, and 98 years on display - rivaling pigment based systems for durability. The Artisan 1430 is the replacement for the Stylus 1400. At first I was a bit taken back by the new Artisan tag Epson gave this printer, assuming these were only assigned to the lower end consumer models and all-in-one devices. While the 1430 is the entry level offering in the 13-inch market, it has the features needed to be a valued addition to the digital photographer's studio, especially for those that are less frequent printers. 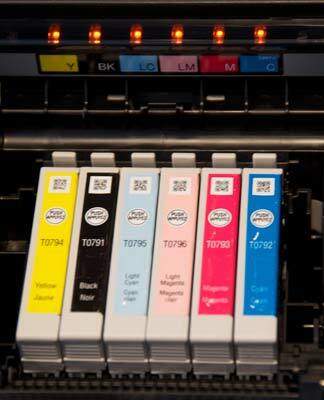 Epson packages the Artisan 1430 with a full set of six individual ink tanks - black, cyan, magenta, yellow, light cyan, light magenta (Figure 1). These inks are Epson’s Claria Hi-Definition inks with improved smudge, scratch, and water resistance. A quick test of this smudge and water resistance showed that the inks live up to their claim - even on gloss paper, water didn’t cause a problem, and it took quite a bit more than normal pressure to see any smudging issues. 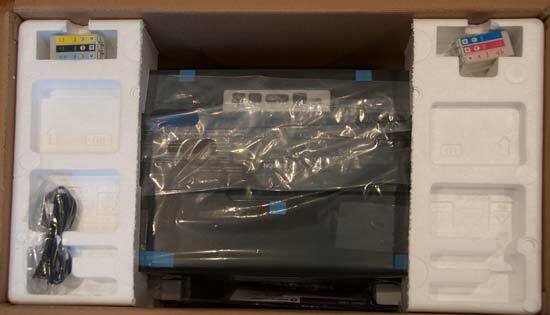 Also included is a tray for printing CD/DVD’s with inkjet coating, and a software bundle that includes Adobe Photoshop Elements 9, Epson Print CD, and driver software. 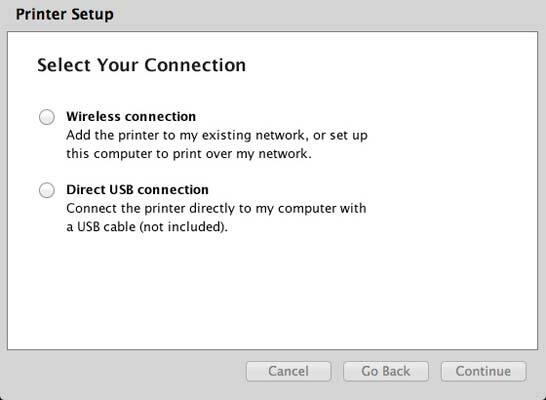 If you’ll be connecting via USB, note that no USB cable is included with the printer. Installing the Artisan 1430 involves the usual removal of seemingly endless pieces of tape and the installation of the ink cartridges (Figure 5). Once this is complete, turn the printer on and let the ink lines charge, the whole process taking about 15 minutes. I set the Artisan 1430 up on my network in about 10 minutes (Figures 3 - 5). 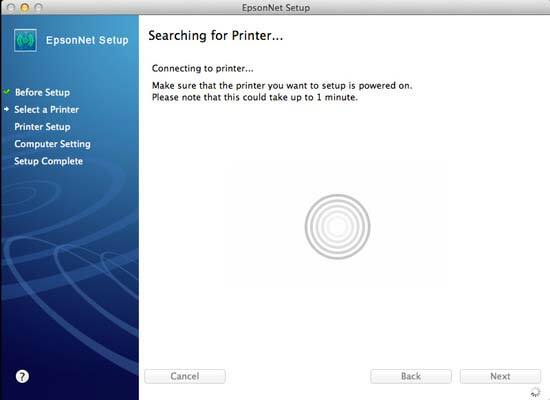 The software installation guides you through the process, and there were no issues finding the printer and adding it to my network. WiFi supports 082.11b/g/n with n giving about 2.5 time the speed of the previous model that supported only up to the g standard. 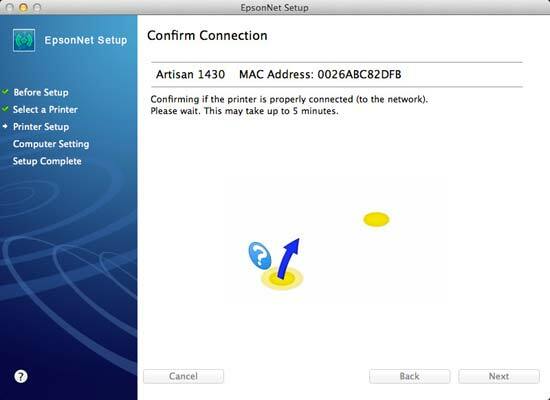 You’ll need to make sure that you’re in the correct mode for your setup - the Artisan 1430 doesn’t have an LCD display like many newer printers do, but there is a very straightforward set of buttons on the top panel that lets you see what the current status is. For WiFi, just press the appropriate button and check for a green light above the WiFi label (Figure 6). Other buttons let you print out a network status page, cancel the current print job, and replace ink cartridges.